The Curious Wavefunction: We are all Hamiltonians. We are all Newtonians. Michael Lind is an economic historian who has recently written an excellent history of the United States. Lind divides the thread of American history as flowing in two parallel but competing directions. One thread belongs to the Jeffersonians who oppose central authority and value small government and individual economic initiative. The other belongs to Hamiltonians who favor a strong central government with broad governing powers. Who wins in this battle? Lind's answer is clear - the Hamiltonians. After doing a careful study of all the institutions and policies that emerged in the United States since its founding, Lind concludes that one can see the sure hand of the Hamiltonians everywhere. He quite certainly does not discount the role of the Jeffersonians in creating private capital, entrepreneurship and innovation, but even these achievements could not have been carried out without an enabling framework set up by the Hamiltonians. Lind's conclusions reminds us that although Jeffersonians Steve Jobs and Bill Gates and Thomas Edison and John D Rockefeller have made this country the technological powerhouse that it is, we live and breathe the air of Hamiltonians like Franklin Roosevelt, Vannevar Bush, Louis Agassiz and Alfred Newton Richards. At the end of the day we are all Hamiltonians. Even when Jeffersonians play their great game of competition and innovation, it is on a Hamiltonian stage with its well-defined boundaries that they must perform. A similar thought went through my mind as I was reading Caltech physicist Leonard Mlodinow's first-rate romp through the major ideas and intellectual events of human civilization titled "The Upright Thinkers". Mlodinow takes us through a sweeping trek through the last ten thousand years of science and technology, covering such major milestones as agriculture, mathematics, Greek, Arabian and Renaissance science, Galileo and the birth of modern science, Newton, the evolution of chemistry from alchemy into a bonafide science, all the way to Maxwell, Einstein and the quantum pioneers. One of the paragraphs that really stood out for me however was one in which Mlodinow communicates the sheer ubiquity of Newton's way of thinking. There is a reason that even with people like Maxwell, Darwin and Einstein following him, Newton can still legitimately lay claim to being the greatest scientist in history. That's because, as Mlodinow says, Newtonian thought has not just pervaded all of science and life but it has become a metaphor for almost everything we do and feel. "Today we all reason like Newtonians. We speak of the force of a person's character and the acceleration of the spread of a disease. We talk of physical and even mental inertia, and the momentum of a sports team. To think in such terms would have been unheard of before Newton; not to think in such terms is unheard of today. Even those who know nothing of Newton's laws have had their psyches steeped in his ideas. And so to study the work of Newton is to study our own roots." This a point that should not be lost on us. Even though the tiny details of our life may be infused with quantum events like cooking, metabolism and reproduction, we are truly Newtonian creatures. Quantum mechanics underlies everything we do, but it's layered on a Newtonian stage of events, metaphors and emotions. These days nobody writes books on Newton's laws and everyone writes books on quantum mechanics and relativity, but the fact is that the weird reality described by these theories matters very little for the mundane things in our life. One of them applies to the very fast and the other applies to the very small, and most of our lives deal with objects in between. Even today after Einstein and Heisenberg and Bohr, 99% of the things that matter to us unfold on a Newtonian stage. Every time we get up from the bed, brush our teeth, drive down the highway, type on our keyboards or fly in an airplane we are obeying the dictates of Newton. Even if our atoms obey the laws of quantum mechanics and dictate the biochemistry of our actions and thoughts, the emergent laws that arise from them and that bear a far more direct connection to our actions are all Newtonian. The fact that we are Newton's children is not just a tribute to the unbelievable sweep of his theories but also a resounding tribute to the limitations of strict reductionism. Just like even an arch Republican like Nixon had to admit that "We're all Keynesians", even people who (improbably) might be rejecting Newton in 2015 cannot escape the reality that they're all Newtonians. The ubiquity of his thoughts holds us in its sweeping embrace as firmly as gravity holds us to the earth. The "We Are All Hamiltonians, We Are All Newtonians" article bothers me, a lot. 1) "We Are all Hamiltonians." The premise of "We Are All Hamiltonians" is essentially that the conflict between Hamiltonian and Jeffersonian thought has largely played out on a stage dominated by proponents of Hamiltonian ideas (i.e. favoring a "strong central government with broad governing powers") - and that this stage has at best played the role of "enabling framework" for Jeffersonian ideals involving "small, (non-centralized) government and individual economic initiative"). This is fallacious reasoning - it boils down to saying "it happened this way (historically), therefore it *is* (inevitably) this way." It avoids contemplating that perhaps the historical evolution of the nation transpired as it did not because of 'Hamiltonism' but rather in spite of it - or even that significant episodes in the nation's economic history (e.g. the Great Depression, the current Great Recession) were created, worsened and unduly prolonged because of an insistence on Hamiltonian "solutions" that were in fact anything but solutions to the challenges at hand. We have been profoundly affected by the legacy of Hamilton, and others. We are not "all Hamiltonians." 2) Mlodinow's contention that "we all reason like Newtonians" is absurd. Although I would agree that we use some language in common, as in Mlodinow's example, the fact is the vast majority of people on the planet are not capable of replicating Newton's thought process vis. calculus and physics. They probably could not even originate the ideas, given a hypothetical absence of Newton. Going further, Newton was decidedly a product of his time and circumstances, and those ideas and experiences that informed his thought process would be largely alien to people today. We stand on the shoulders of giants, but we don't think like them - by the same token, we are not Newton's children. We are the recipients of his incredible insights into optics, physics and mathematics, insights that go a long way toward a functional understanding of the behavior of our perceived reality. We are not however, spending years of our time trying to turn lead into gold. We do not reason like Newton, or Newtonians. 3) Likening Hamilton to Newton is fallacious. 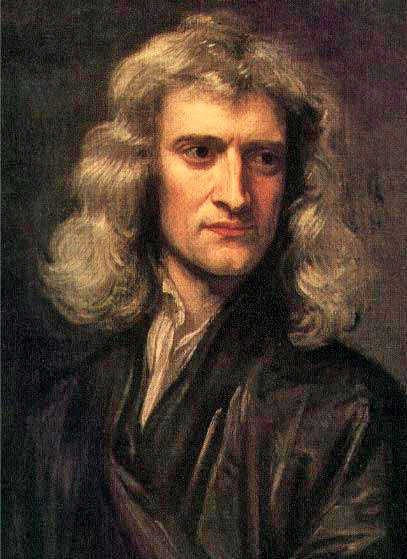 Newton, as a scientist, was concerned with drawing conclusions from reproducible observations of physical phenomena. Hamilton, as a political and economic thinker, was concerned with speculations on the nature of man and political institutions. There was a profound difference in the methods, strategies, and resources used. There is a profound difference in the confidence we can have in the findings of each. c) imposition of an import surcharge. The results of the "Nixon shock" were to send the price of gold soaring, and stagflation. The mistaken and inaccurate Liberal-promoted meme that "we are all Keynesians" in reality died a hard, unpleasant death in the 1970s. "On August 15, 1971, I did something that went against my every instinct about what is good for the American economy: I imposed a 90-day nationwide freeze on wages and prices, to be followed by a gradual return to decontrol. History told me that while controls might be politically popular, they would be economically disastrous. Over my protests, an opposition-controlled Congress had given me power to impose controls. With inflation worsening, there was a swelling chorus of demands in Congress and the media that the power be used. When controls were imposed in August 1971 the nation stirred with excitement and sighed with relief. In the first day's trading, the Dow Jones average on Wall Street rose 33 points. But it was a false euphoria. In the short term, controls provided relief; in the long term, they made the situation worse. Once in place, they were more difficult to get rid of in an orderly way than I had expected." "We should address the deficit through spending cuts, not tax increases. The deficit exists not because the American people are undertaxed but because the US government overspends." So - in conclusion, we are not now, nor have we ever been, "all Keynesians." The "quote" was manufactured and spread, and continues to be used, to promote an agenda of increased government power and control by a single political party. What is the purpose of elevating Hamilton in this way? I suspect ultimately the Hamiltonian argument yields a nation that is not a democratic republic, and that this defense of the Hamiltonian idea is really an intellectual whitewash of a power grab by the Democrat-aligned bureaucrat class. In the last seven years, which zip codes in the US have become the wealthiest, and is that good for the nation? Has pursuit of these 'Hamiltonian' ideals led to greater transparency, or evidence of an embarrassingly high level of corruption, cronyism, misuse of office, and political suppression? Why have there not been any prosecutions for behavior that by *any* standard is absolutely outrageous? Why is our Congress considering legislation that is not accessible to public (and even legislative) scrutiny? We are not all Hamiltonians. Nor should we be. Thanks for your detailed comments: I suspect we agree more than we think. Both Jeffersonians and Hamiltonians are essential for a country's progress, and both have their pros and cons as you rightly pointed out. But the sheer scope and size of the development of a country like the US makes it inevitable that even Jeffersonians will occasionally have to adopt Hamiltonian policies: a good example is presidents Reagan and Bush who in spite of being seemingly Jeffersonian enacted Hamiltonian policies when it came to things like welfare and trade. Both men wisely understood that proper governance needs both philosophies. In fact Jefferson himself became a Hamiltonian when he signed off on the Louisiana purchase and embargoed British shipping in the years before the War of 1812. It's heartening to me to see that leading Jeffersonians in this country have understood the need to adopt Hamiltonian policies, even as they continue to abide by their core Jeffersonian principles. It is this creative tension that propels national development. Actually, now that he's threatened with banishment from the $10 bill, I feel rather sorry for the fellow. Not that he minds. I gather too that the British are ditching Adam Smith from one of their bills in favor of some more politically palatable individual. I’m guessing you would include our favorite sports as well, like baseball. Well I suppose you are right about newly published books but one that is still popular, now in its 3rd edition, The Physics of Baseball, by Robert Adair, reminds me that you are completely correct when you say “99% of the things that matter…unfold on a Newtonian stage.” Maybe 99.9%? And what if you are like one of the Amazon reviewers who is completely stumped by Adair’s lucid and fun little book? A modern human with a stone age understanding of nature...I suspect about 50% of the voting public might qualify.